Sometimes the perfect storm is a good thing. On Sunday, I was driving from Santa Rosa, CA south to Ventura. I was scheduled to begin two weeks of recording for a digital photography title with Lynda.com. I knew I would be there in the studio when Aperture 2.0 was announced, but wasn't at liberty to discuss it. But what a great opportunity! Wouldn't it be wonderful to actually record the training title on the day Aperture 2 was released? My producer, Chris Mattia, had a similar thought once he heard the news. By 9:30 am on Tuesday, he was clearing a path to enable us to start recording the Aperture 2 New Features title. Fifty-five hours later, 22 movies were posted online ready for viewing. Six of the movies are free and can be viewed by anyone right now. As I admit in the first movie in the title, I don't tackle everything that's in this release of Aperture 2. But I do think we covered the stuff that's really important. Plus, having the opportunity to work in such a timely manner is very exciting. And in case you were wondering... this is a great release of Aperture. Apple did a terrific job. "At first glance the Sony Cyber-shot DSC-W200 looks like a fairly run-of-the mill compact camera, with an understated, compact silver body, 3x zoom lens (35-105mm) and 2.5 inch LCD screen. Look a little closer though, and you'll find that there are some more impressive stand-out features. Most obvious is the headline-grabbing 12 megapixel resolution, now the standard for any self-respecting top-of-the range compact like the W200. Next up is true optical image stabilisation via Sony's Super SteadyShot technology, which combined with the extensive ISO range of 100-3200 promises to make blurry photos a thing of the past. The Sony W200 also offers a true Manual shooting mode which allows you to set both the shutter speed and aperture, and there's also an optical viewfinder for ease-of-use in bright sunlight. The Sony Cyber-shot DSC-W200 is therefore a mix of humdrum and rather more exciting features, on paper at least." "The 12 megapixel sensor may give you bags of resolution to play with, but it comes at the cost of noisy images at the slow speed of ISO 200 and quite a lot of unwanted chromatic aberrations." Hmmmm.... I guess the 12 megapixel debate discussion continues. If you're interested, you might want to read Mark's full review. "I thoroughly enjoy capturing insects, spiders and other creepy crawlies on my little pocket-sized Canon Ixus 800 IS camera," says Ruth Cooper. "It goes everywhere with me, since I never know when I'll find something interesting to capture." "I usually wear clothing that blends into the garden surroundings, and an old blue cloth hat that shades me and my glasses." "The sound on the camera has been turned off, and I almost always have the camera on the Digital Macro setting, which still gives me automatic focus on the subject. I also try to stand either in the shade, or so that my silver camera and lens don't glint in the sun and disturb the insects I'm pursuing. 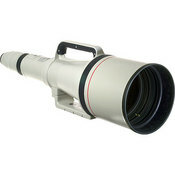 I don't use any extra photographic gear -- no tripod, light diffuser, remote release, macro lens, etc. (The insects wouldn't wait around for me to set up, and a bigger camera with its attachments would be too heavy for my arthritic hands to hold.) Under these circumstances the camera's image stabilizer is a real blessing." "On the afternoon, I discovered this damselfly on my cherry tree, it was very windy, but this was to my advantage, because he was hanging onto the branch for dear life, or he'd have found himself in the next suburb! (So don't be dissuaded by those who say you can only photograph bugs on still days!)" "I approached the damselfly quietly and slowly, with no sudden movements. I started shooting from a slight distance, and gradually eased closer, and increased the depth of the macro setting. The wind was blowing the twiggy branches around, and I had to wait for a lull in between wind gusts to get each shot." "After a few minutes the damselfly ignored the camera and me, and I was able to manoeuvre the camera to capture the close-up of his eyes, head, and his whiskers!" For this intimate insect shot, Ruth set her Canon IXUS 800 camera to Digital Macro at 3.4X. Wow! 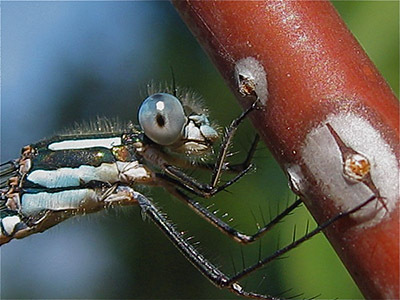 Photo of Damselfly on a Cherry Tree by Ruth Cooper. After months of speculation by the Aperture user community, Apple today released Aperture 2.0 with a raft of new image adjustment tools, an overhauled Raw decoder, major speed improvements, and additional camera support. Interface Changes, cleaner looking (and easier to understand) UI, including the tabbed inspector, double-click behaviors, and the new All Projects, which is similar to Events in iPhoto. Performance Improvements, including an optimized database for better searching and browsing, and Quick Previews that use available Jpegs instead of always decoding the Raw file from scratch. 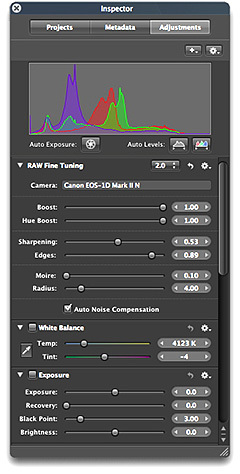 Photographers can use this mode for everything but image editing. Image Decoding and Adjusting, including the Raw 2.0 decoder and a host of new editing tools. Aperture now includes Baseline DNG that enables users to work with DNGs, even if the native Raw format isn't supported by Aperture. New Camera Support, featuring Canon G9, Canon EOS 1Ds Mark III, Nikon D300, Nikon D3, Hasselblad CF-22, Hasselblad CF-39, Leaf Aptus 75s, and the Sony Alpha DSLR-A700. New users can now move over to Aperture for a cool $199. That's $100 less than the previous version. If you already own a copy, you can upgrade for $99. There's also a 30 day trial version available for download right now. If you like it, you can simply purchase an upgrade or full price registration number. If you want to learn more about Aperture 2.0, visit Inside Aperture, where there's a new podcast interview with product manager Joe Schorr about the new features in 2.0, and a variety of blog posts by photographers who have been using the new app. Most of our DSLR's have pop up flashes, and most of us aren't using them as often as we would like. Why? Primarily because they produce harsh, unflattering tones. But a new $29.99 accessory called the Lightscoop could change that. Here's how Professor Kobre explains it. Professor Kobre's Lightscoop slips over your Nikon, Sigma, Pentax, Fuji FinePix, or Canon camera’s pop-up flash and allows you to bounce the flash like professionals bounce an expensive external flash. 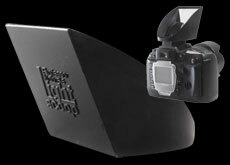 The Lightscoop is the inexpensive answer to natural looking bounce flash and digital photography lighting. (Even professionals like it for casual shooting!). When I'm in big cities, I try to travel by foot as much as possible. That's when I see the good shots, and if I'm lucky, I come home with one or two. I was walking back from a dinner meeting in Las Vegas with a Canon G9 and a small Gorillapod tucked away in my jacket pocket. I felt like shooting something, but nothing caught my eye until I climbed a set of stairs for a street overpass and noticed this scene. I wanted the streaming lights of traffic driving by, but I thought they would look best in context with the Las Vegas cityscape. I mounted the Canon G9 to the Gorillapod and wrapped its legs around the edge of the overpass so I could compose the scene. I made sure the flash was turned off and set the ISO to 80 to control noise. I then went to manual exposure mode, which is very easy to use on the G9, and played with the settings until I saw what I liked on the LCD screen. The exposure was 1.3 seconds at f-2.8. I set the self-timer to anticipate when traffic would begin to move, then pressed the shutter button. Some of the frames didn't have the right look. But this image has a nice combination of moving lights and stationary objects. So it became my "keeper" for the night. 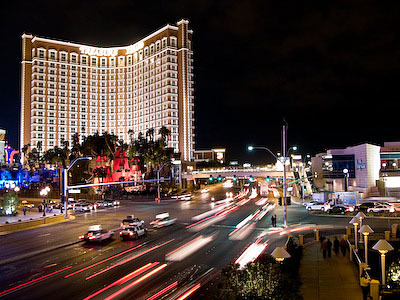 Photo of Las Vegas traffic by Derrick Story using Canon G9, 1.3 seconds at f-2.8, ISO 80, using manual exposure mode. I've never been a fan of creating layer masks in Photoshop to adjust specific areas of color and tone. It's a lot of work. 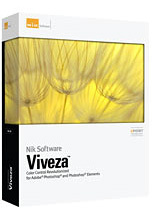 Nik Software has come to the rescue with Viveza, a plug-in for Photoshop and Photoshop Elements (Mac and PC) that allows photographers to use U Point technology to adjust their images. This is the same technology Nik employs in Capture NX. And it is incredible. Basically, you just click on a color that you want to adjust and a U Point tool appears with brightness, contrast, and saturation sliders. If you move any of those sliders, Viveza modifies all of those specific colors in the photograph. If there's an area you don't want affected, just click on it and it's protected from the adjustment. You can watch a short tutorial on Nik's web site. This plug-in is not cheap. It's going to list for $250 US when it's released in April. But it is truly amazing and will save hours of image editing time. I'll get my hands on a version as soon as its available, and I'll post another report. I stopped by the Sony booth at PMA 2008 to test the Sony alpha A350 DSLR (available as preorder for $899.99 US with 18-70mm lens on Amazon). What intrigued me most about this camera was the combination of Live Preview and a tiltable 2.7" Clear Photo LCD Plus screen. The screen angles upward for low angle shooting and downward for capturing shots while holding the camera over your head. You can also press it flush against the back of the body. This opens up additional shooting possibilities for DSLR fans who weren't previously able to compose shots at extreme high and low angles. Plus, if you're working on a tripod, you can position the screen for your most comfortable viewing angle regardless of its shooting height. I tested the Live Preview and it worked well, however, moving subjects weren't as smooth as I had anticipated. Since this is a still DSLR and not a camcorder, I don't see that as a huge drawback. Other specs are impressive too: 14.2 MP Super HAD CCD sensor, up to 3200 ISO, CCD based stabilization for any lens mounted on the camera, robust battery, anti-dust technology, 9-point center cross AF sensor, and dual media slots for Memory Stick PRO Duo and CompactFlash. The camera felt good in my hands and is quite light, making all day shooting treks less straining on the neck and back. I'll keep an eye out for follow up reports once the production model hits the streets in late April. 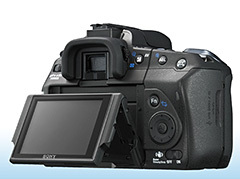 But I think Sony has taken another positive step forward with this advanced consumer DSLR body. Shooting from a helicopter is tricky business. You have to photograph through glass that is often curved and full of reflections. Unlike with other through-glass shooting, you can't put your camera lens up against the surface because of the rotor vibration while flying. I was dealing with all of these factors while capturing this image of Hoover Dam with Lake Mead in the background at the Arizona/Nevada border in Southwestern USA. So here's how I did it. I used a Panasonic LUMIX TZ5 (just announced at PMA) in aerial scene mode. What that does (and what you can do on your own) is activate image stabilization and "warm up" the white balance to offset the coolness of shooting from above. I then looked for a patch of clean glass and held the camera as close to it as possible without touching it. I watched the reflections as the pilot maneuvered, and shot when the reflections weren't apparent. You can increase your odds of success by wearing dark clothing (that doesn't reflect in the glass as much) and bringing a polarizer filter. Both help minimize reflections in the glass. If you're using a compact, bring one that has as wide a focal length as possible. The TZ5 goes to 28 mm, which helped considerably for capturing big scenes. 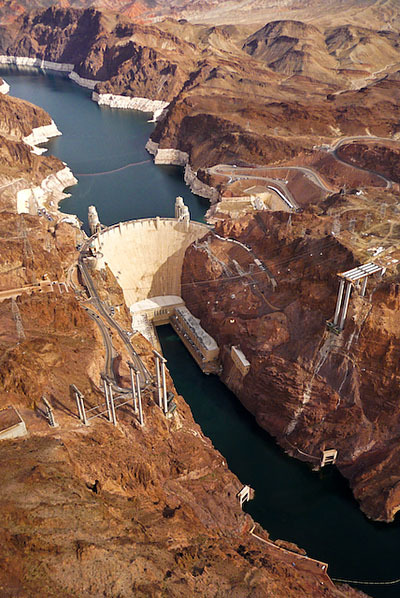 Photo of Lake Mead and Hoover Dam by Derrick Story using Panasonic TZ5, 1/320th at f-3.3, ISO 100, using aerial scene mode.